Youth Action Board of YWCA Olympia is a youth-led group of female and non binary identifying people who are working towards engaging the community to promote activism and intersectional feminism. In the past, we have conducted Participatory Action Research for youth in our community, collected signatures for De-Escalate Washington and campaigned for Home Fund in Olympia. We are committed to working with other organizations with similar values and missions. We strive to create a respectful and inclusive space to encourage youth leadership, while supporting all people affected by racism and patriarchal oppression. Interested in learning more about the Youth Action Board? We want to hear from YOU! The Youth Action Board wants to hear from YOU! The Youth Action Board is working to identify barriers to empowerment in our community! Please take few minutes to answer the survey. We want to hear from people of all genders and all ages! Fill out our survey HERE! March 2, 2018 NEWS: Youth Action Board releases March For Our Lives Statement. This research depends on your participation! 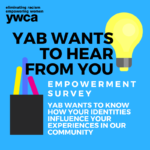 If you identify as a girl, young woman or femme, take this survey and join our Instagram campaign #WhyIFeelEmpowered! Enter your favorite image of self empowerment to have the chance to have your image featured in a gallery showcase. 3. Tell us in the comments how this image reveals your empowerment! PS: Check out PAR on the Living Stage at Hotel RL talking about the #WhyIFeelEmpowered campaign! What makes the Youth Action Board so unique?